People that know me know I’m almost always freezing. I can have goosebumps mid summer. 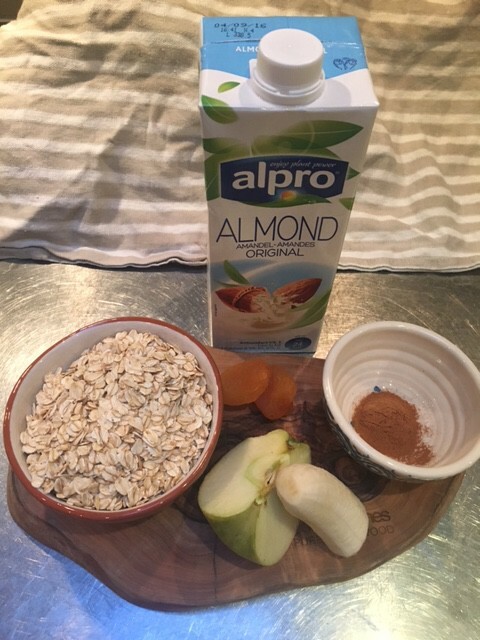 A few weeks ago I decided it was time to take action, since then my breakfast consists of porridge. Some of you might think I’ve lost my mind to put up a post for porridge and you might not deem it worthy of trying, but trust me, it is!! This is soooooo good. The recipe can be used for overnight oats as well. Those of you who don’t mind the cold can eat that and my fellow chilly people can make the porridge. Cut the banana in pieces and add to either a measuring bowl (high), blender, or whatever you plan on blitzing the mixture in. Mash with a fork. Cut the apple in teeny tiny pieces, as well as the apricot. *As an alternative you could also use dried prunes (if you do use prunes, try to get a hold of the mushy ones), or one apricot and one prune. In the meantime add a lug of almond milk to a small pan and heat. Once hot, add to the fruit mixture and blend. Then add your rolled oats and blitz again. You are looking to get a dence consistency, however try to keep it a little bit mushy. If it’s too dence you might get lumpy porridge. You get the best result if you make this in the evening and keep it overnight in the fridge in an airtight container, but I’ve also made many the morning of and used them instantly. Especially for porrigde that is absolutely fine. Take one or two table spoons of your mixture. Add yoghurt, mix and finish off with lovely fresh mixed berries. Heat 100 ml of almond milk on the stove. Once heated, add 1,5/2 table spoons (depends on how thick you like your porridge). Use a spoon or a fork to mix in the porridge and to make sure it’s as lump free as possible. There will always be a few pieces of the apricot, or some small pieces of rolled oats. Once hot, hot, hot, dish up and enjoy!